When is not a goal a goal in hockey? Something interesting happened in the game between the New York Rangers and the Anaheim Ducks tonight. A goal was awarded to the Rangers in the final second of the game even though the puck did not cross the goal line! Now before I explain how that can happen, I am unaware of this possibility in football or baseball. Even if a wide receiver is interfered with in the end zone, the consequence is simply a pass interference penalty that puts the ball at the goal line. In baseball, the closest thing might be a balk with the bases loaded that forces in a run without the benefit of any doing by the offensive team. However, in basketball, there does exist instances in which a basket is counted even when it has not gone into the net… which is called goaltending. 26.1 Awarded Goal – A goal will be awarded to the attacking team when the opposing team has taken their goalkeeper off the ice and an attacking player has possession and control of the puck in the neutral or attacking zone on, without a defending player between himself and the opposing goal, and he is prevented from scoring as a result of an infraction committed by the defending team (see 26.3 Infractions –When Goalkeeper is Off the Ice, below). That’s awesome. I actually would’ve preferred a penalty shot on an empty net to formalize the goal. I equate that to an intentional walk in baseball in which the pitcher still has to throw four balls wide of home plate to formalize the bases on balls. If you do a search on Awarded Goal in the NHL rulebook, there are actually several instances in which a goalless goal may occur. Most, if not all, occur when the goalie is removed for an extra attacker. My favorite one is Rule 67.5. To summarize, if the goalie builds a snowman in front of the net before he leaves the ice for an extra attacker, the opposing team is awarded a goal. Hahahaha! Rest in peace, Alexei Cherepanov, 19. Today brought shocking news to hockey fans all over the world. The news was especially shocking to New York Rangers fans and Avangard Omsk fans. The bright and unlimited ceiling of 19-year old Omsk player and top Rangers prospect, Alexei Cherepanov, was quickly wiped out today. In the middle of a game, Cherepanov collapsed on the bench. Medical personnel were unable to restart his heart. He was pronounced dead shortly after arriving at the hospital. The cause of the collapse is still unclear. Rumors of an accidental elbow to his chest during a collision with teammate Jaromir Jagr have been circulating. As a Rangers fan since the late 1980s, the past few years have finally brought happiness and hope to Rangers fans for the first time since the 1994 Stanley Cup season. Besides their recent playoff success, the excitement of up and coming young players from Hartford and the junior leagues has kept fans excited about the future of the team. Since their 1994 Stanley Cup, the Rangers have had very limited success in the playoffs and having high-ceiling prospects pan out (Remember Pavel Brendl, Jamie Lundmark, and Manny Malhotra?) 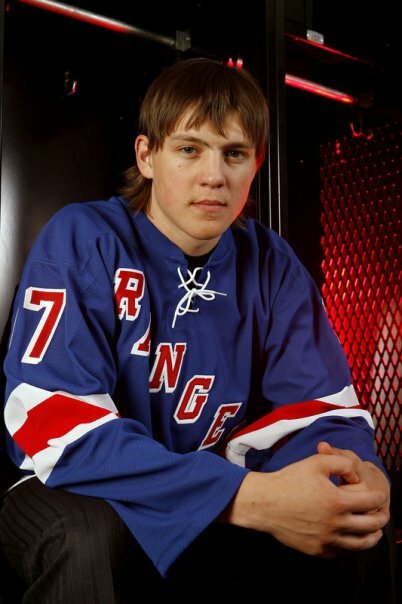 However, it wasn’t until the pick of Cherepanov by the Rangers in the 2007 NHL draft has a player caused so much excitement for the fans. Would Rangers fans finally be treated to a player on the level of an Ovechkin, Malkin, or a young Bure? Cherepanov had only dropped to the Rangers at the 17th spot because of the lack of clarity on the expiring transfer agreement between the Russian leagues and the NHL. On talent alone, Cherepanov was easily a top 5 pick, with a potential ceiling higher than most of the other picks. He shows finesse and speed in his skating, skill in scoring and passing and has the potential to be the complete all-around player. He continued showing those skills by besting season points of now-NHL stars Evgeni Malkin, Alexander Ovechkin and Ilya Kovalchuk in their first seasons in the Russian Super League. He also surpassed the Russian league rookie goal scoring record previously held by Pavel Bure (17 goals). Cherepanov had been off to another great start this year, recording 7 goals and 5 assists in 14 games for Omsk. Rangers fans were very hopeful that this would have been his last year in Russia as his contract with Omsk expires. The thought that he could be plugged into the Rangers new high-powered offense was scintillating. With the Rangers looking good at 4-0 this year, and many new faces contributing, this news is very difficult to digest. The addition that the player that accidentally collided with him was Jagr makes it even more difficult to swallow. In a way it’s better he passed away in the game he loved rather than for any other reason.